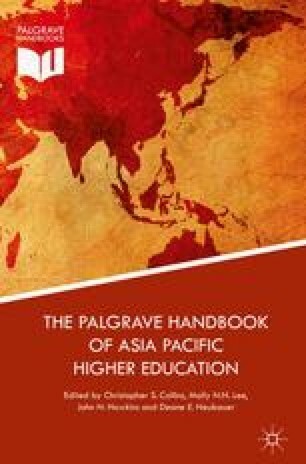 The chapter provides an overview of the current development of higher education (HE) in Thailand. It also includes some basic information on HE policy provision, number of higher education institutions (HEIs) and students, and system of HE with the focus on mainstream HE administration under the supervision of the Office of Higher Education Commission, Ministry of Education (MOE). The changing scene of HE in Thailand is a product of the National Education Reform of 1999 that affecting the structural change of HE administration, personnel and financial management. Subsequently, the Long Range Plan on HE for 2008–2022 was formulated to address the issues such as quality of students, lifelong learning, and employability of graduates. The Plan calls for adjustment of HE system to articulate with basic and vocational education, to strengthen governance and accountability, to enhance staff development, to develop learning infrastructure, to promote institutional networking, to enhance of national competitiveness, and to solve social issues. One of the outputs of the reform is the revision of Private HE Institution Act to obligate the quality of private HEIs with the same standards of the public ones. The new HE development embraces regional cooperation toward the ASEAN Community. Thai Laws.com 2015. “Royal decree on criteria and procedures for good governance., B.E. 2546 (2003). Available at: http://thailaws.com/law/t_laws/tlaw17512.pdf. Accessed 9 Dec 2015. Yilmaz, Y. 2010. Higher education institutions in Thailand and Malaysia–can they deliver? http://siteresources.worldbank.org/INTEASTASIAPACIFIC/Resources/Thailand-Malaysia-HEInstitutions.pdf. Accessed 29 Aug 2016.